According to the press release, the following companies are under investigation: Teva, Allergan, Endo, Janssen, Purdue Pharma. The review and investigation concerns questions raised by the marketing and sale of opioids. Initially, the investigation focused on manufacturer Purdue Pharma, then extended to other manufacturers and distributors. The following distributors are under investigation: McKesson, Cardinal Health and AmerisourceBergen. Among other things, the attorneys general are seeking to obtain and review documents and information about sales and distribution practices of the subject manufacturers and distributors. About 5 % of those patients who misuse opioid will transition to heroin. Of all the people who use heroin, about 80% first misused opioids. 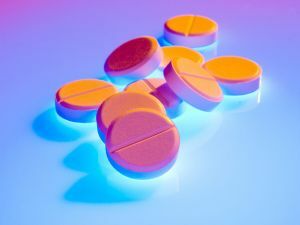 The Centers for Disease Control and Prevention (CDC) estimates that about 20% of all patients presenting to medical practices with noncancer pain symptoms or pain-related diagnoses receive an opioid prescription. In 2012, health care providers wrote 259 million prescriptions for opioid pain medication, enough for every adult in the United States to have a bottle of pills. Opioid prescriptions per capita increased 7.3% from 2007 to 2012, with opioid prescribing rates increasing more for family practice, general practice, and internal medicine compared with other specialties. Rates of opioid prescribing vary greatly across states in ways that cannot be explained by the underlying health status of the population, highlighting the lack of consensus among clinicians on how to use opioid pain medication. The most common prescription opioids are: hydrocodone (e.g., Vicodin), oxycodone (e.g., OxyContin, Percocet), oxymorphone (e.g., Opana), morphine (e.g., Kadian, Avinza), codeine and fentanyl. Opioids work on the brain and are used to inhibit the transmission of pain signals in the body. Side effects, including drowsiness, mental confusion, nausea, constipation, and depression are very common. The CDC has developed important guidelines for prescribing opioids in primary care settings. Healey and other state attorneys general have undertaken a massive collective effort to investigate and prosecute civil and criminal law enforcement actions to combat the opioid crisis, including actions in partnership with the Federal government. The investigation summarized above is one of many that are part of a broad net cast by State and Federal law enforcement for offending manufacturers, distributors, and healthcare providers. If you have questions about this post, you may contact our business and healthcare law firm at info@hamillittle.com or either of our two Georgia offices.